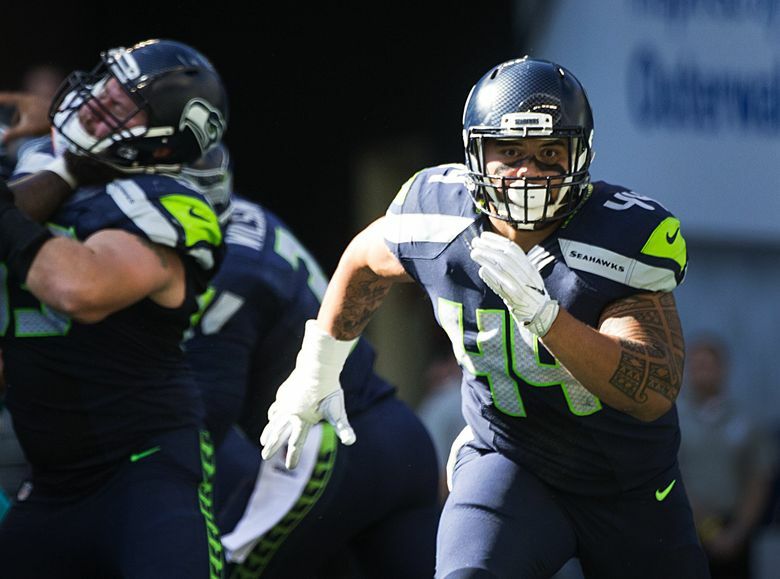 Seattle Seahawks fullback Tani Tupou runs a route in the second half during the Seahawks season opener against the Miami Dolphins at CenturyLink Field on Sunday, Sept. 11, 2016. The Seahawks beat the Dolphins on a last-minute touchdown by Doug Baldwin, 12-10. Also, Dwayne Washington scored a touchdown in his NFL regular-season debut. Tani Tupou, an undrafted free agent, made his debut as the Seahawks’ rookie fullback on Sunday, playing 10 snaps in Seattle’s 12-10 victory over Miami. Beats a day of playing “carpool mom” for his Husky teammates. Tupou was one of Washington’s most respected senior leaders last season, and UW coach Chris Petersen said Monday he’s happy for the Huskies’ former starting defensive end. Former UW running back Dwayne Washington, a seventh-round draft pick, also made his NFL debut on Sunday, and scored on a 1-yard TD run on his second pro carry in Detroit’s victory over Indianapolis.